The Customer Order Processing Module stores customer accounts details including: addresses, emails, phone numbers, faxes etc. A feature to set credit limits, record customer balances and put an account on “stop” is included in the system. There is an optional facility for these to be automatically updated from your accounting software. Default addresses are automatically selected and entered when an order / quotation is created. Multiple addresses can be stored for order acknowledgement, invoicing and delivery. Alternative addresses can be selected from the available addresses, specific to the customer; or if the address is a "one off" address, it can be entered, directly against the order as it is being keyed in. There is the facility to hold multiple prices per item, along with discounted prices for a date range, by product or customer. There are many options for setting selling prices. This can be unit price per linear metre, square metre or using a price matrix. Surcharges for additional features can be added as units or as percentages. Default discounts can be stored for each customer and discounts set for promotional periods, (by product and/or customer). Price bands can be used either by product or customer group. 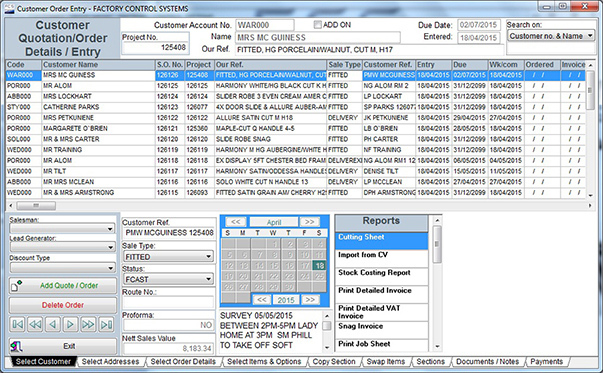 A menu is available to store customers own part numbers and descriptions, so that they can be linked with internal codes. 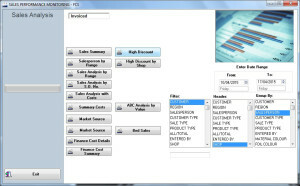 You have the ability to enter multiple reference numbers and data against each order, i.e. project, sales order, customer reference, sales reference, our reference etc. There is the facility to add items to orders that have predefined options, ensuring that the choices selected are valid. It is easy to switch from 'quotation' or 'forecast', to 'order' status, enabling the release of an order for manufacture; and again to 'completed' status, once the order has been despatched. A detailed or summarised Quotation Report and Order Acknowledgement are available. These can be easily emailed or faxed directly from the system. The module has the facility to set the order to a 'returns' status and to add comments for product returns. Appropriate reference data can also be entered for easy tracking. There is the capability to import from CAD systems, Excel template files, XML or CSV files. The Sales Performance Monitoring Module allows you to analyse sales by: product, product type, region, customer, customer type, salesmen, order type etc. A full 'suite' of reports are available to show the analysis of sales values for each Project / Sales Order No. for each day / week planned, along with gross profit at standard or current costs, and whether or not an order has been despatched and an invoice has been printed.